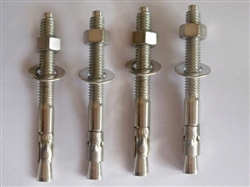 Stainless Steel 304/316 Wedge Anchor(Through Bolt),Hot dip galvanised wedge anchor(through bolt) with Stainless Steel clip and sleeve anchor with eye (open)hook bolt from Yuyao Xintai Hardware Co., Ltd.
YUYAO XINTAI HARDWARE CO., LTD is a professional manufacturer of various anchors, high strength fasteners & non-standard hardware parts. We own the self-management import and export right. It is located in Huangjiabu Zhen, Yuyao City, Zhejiang Province, China, and adjacent to Shanghai, Hangzhou & Ningbo. Our company covers an area of more than 7000 square meters. More than 80 professional workers work in here, nine of whom are senior technicians. We have 15 sets of cold heading machines, four of them are multi-station cold heading machines.More than 20 sets of punching machines, five of them are high speed auto machines. More than 30 sets of turning machines, nine of them are CNC turning machines. 1 set of hydraulic molding machine and around 20 sets of thread rolling machines. We have a professional mould workshop. We can design and produce all kinds of stamping die by ourselves. We are equipped with independent laboratory with universal material tensile testing machine, vickers hardness tester, salt spray testing machine and pull out testing machine specialized for anchor&rsquo;s function. We have detection capacity to test material mechanical properties, surface coating performance and anchor&rsquo;s function. Our production capacity per month is around 40 containers equal to around 800 tons. Our products are sold to America, Europe and Australia. Our annual sales grows around 20% per year recently. And we have been into the top ten in domestic same industry. We have registered the trademark as XTANCHOR. We designed and developed a series of anchors with ourselves characteristics. 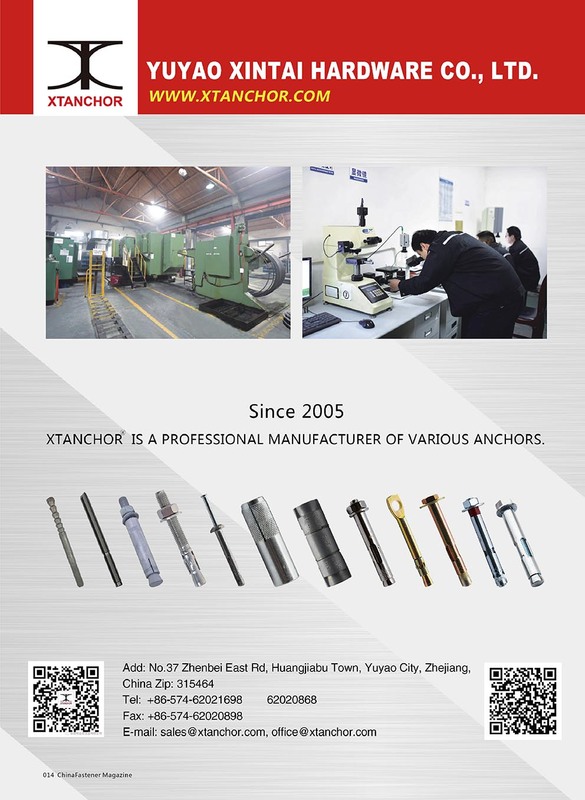 We have begun to sale anchors with our trademark in the domestic and global market. Our quality policy is: Striving for survival by quality, Seeking development by variety, Exploiting market by integrity, Questing efficiency by management. 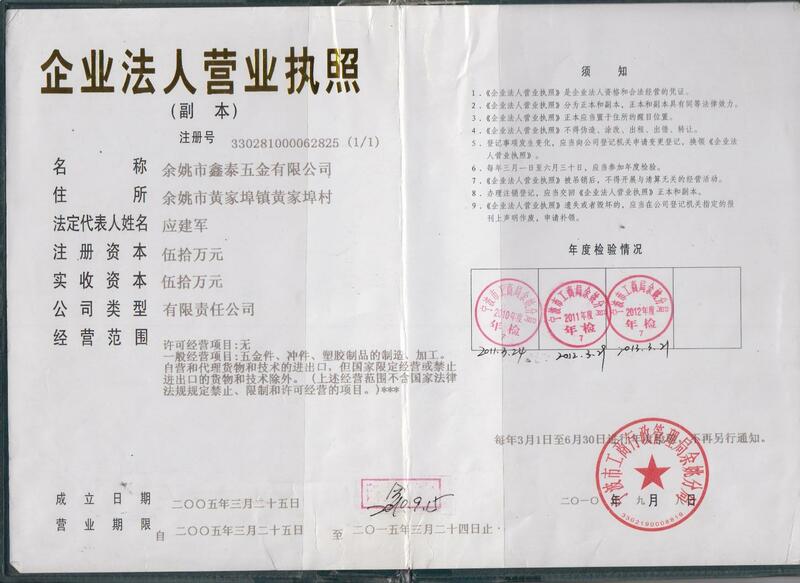 Company Name Yuyao Xintai Hardware Co., Ltd.
Draw-In Anchor(S Type) ?EKMEL? DüBEL “ S ” T?P? 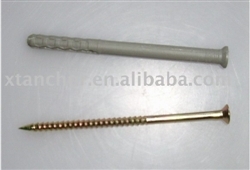 To: Yuyao Xintai Hardware Co., Ltd.